Samsung has announced the Galaxy A9 in China, and it sports a huge 6-inch screen and massive 4,000mAh battery, proving the rumors correct. 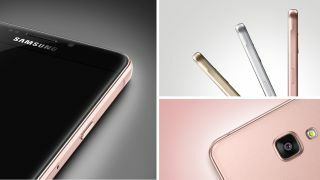 While the Galaxy A9's 1080p Super AMOLED display positions the new handset firmly in the phablet category, the screen is also 2.5D curved glass. With metal frames and a glass back similar to the Galaxy S6, it also sports a 13-megapixel primary camera and a front-facing, 8-megapixel secondary camera. The handset is powered by a 64-bit octa-core Snapdragon 652 processor, along with 3GB RAM and an impressive 4,000mAh, which dwarfs the Galaxy S6's 2550mAh battery. Users will get 32GB of internal storage and a microSD card slot, and an embedded fingerprint sensor in the home button. Pricing has still yet to be announced, which might not matter as, though the Galaxy A9 will be available in China later this month, there's no word yet on if, or when, it'll be released in other regions worldwide.